6 year old Maurice John Mann lived at Chittleford, Widecombe, when he was admitted to the local school in 1908. The son of S J Mann, a farmer, he left to go to Ashburton, but returned to the school a few months afterwards. He finally left in December 1916. Maurice married Hilda M Perkins in 1930, in the Newton Abbot registration district. Born in Buckland-in-the-Moor, Hilda was the daughter of an estate foreman. After attending Ashburton Council School she passed an examination to gain a free place at the Grammar School, where she was taught by Mr Naylor. Hilda's brother Henry Jeffery Perkins had been the only person from Buckland-in-the-moor to die in WW1. See Roll of Honour WW1 M-S, under Ashburton in Peril, for more on Henry. In 1939 Maurice Jn Mann, West St., Ashburton is listed under Wireless Engineers in Kelly's Directory. Newspapers in the 1940s frequently record that Mr M J Mann provided the music and microphone at local events. The Landscove fete in 1949 in aid of the Victory Hall Building fund was one of them. 'Maurice Mann used to work for the Whitley family, and became fascinated playing with electricity. He taught himself to be an electrician. Above: Extreme left. M J Mann's shop at no 3 West St. Is it supported on pillars? Cont. 'At 'Mann's' they sold a whole range of electrical items and also played an important role in keeping accumulators charged for the town and surrounding areas. Accumulators were basically another name for batteries, which used to run people's wireless radios. Customers would bring them in once a week and they would be exchanged for a fully charged accumulator. The accumulators would be charged in the sheds behind the Ambulance Hall, on the way to the recreation ground - they are still there today. A week later they would be returned and the whole process repeated. The fee for this service was 6d (two and a half pence in today's currency). Hilda was still delivering accumulators until the day before she gave birth to her daughter, Geraldine. 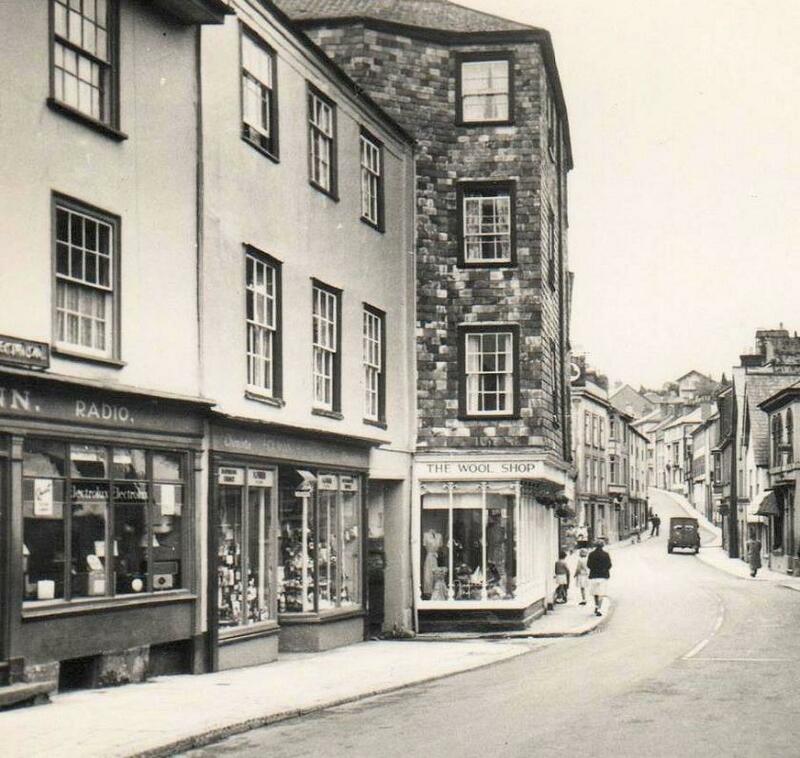 Maurice also purchased No 4 West Street, that at one time had been Eastman's the butchers, who moved to North Street. No 4 was opposite No 3, and became the workshop for repairing all items including wirelesses. televisions, hoovers etc. The river Ashburn runs under both shops and Geraldine remembers that No 4 flooded regularly. When heavy rain was forecast she had to rush to pick up any televisions and radios that were on the floor waiting for repair, and put them safely high up on tables. Until the flood prevention scheme the river would run right through the shop. The Manns also owned Eastern Garage, which they rented to Jim Pearce. In 1953 the monks of Buckfast Abbey were given permission to watch the Queen's coronation. Father Ignatious allowed a television aerial to be erected on the top of the tower of the Abbey to receive a signal from the Welsh transmitting station Wenvoe so that the monks could watch the broadcast. Very many thanks to Alister and Geraldine Jamieson for the above item. * L[ewis] Arscott, Radio Engineer, was at 40 East St sometime in the early 1930s. He did repairs, and supplied accumulators, much as Maurice Mann did at the end of the decade. Unless Lewis moved to West St it seems likely that Maurice took over the business, but not the premises. See the item about Lewis Arscott under Occupations 1900s, under Banks and Businesses.